In this lesson, we are going to go through one of the most common question types. Indeed, it attends almost every single passage that you will encounter on the GMAT, and that is the primary purpose. In other words, why did the author write the passage? That is the question we are asking when we see, what is the primary purpose of the passage. So, what we're gonna do, is take a very familiar passage, one that we've been working on over this video series, and that is the one regarding oligodendrocytes and brain plasticity. What I've done here is I've taken a part of that massive passage, a part that is subtle maybe easy to miss but very important. The part I left out is one that is more obvious. If you remember, the study was or rather the passage was about evaluating a study. Describing what two scientist or a team of scientist figured out or found out as far as oligodendrocytes and plasticity are concerned. And so that's pretty easy to get the primary purposes to discuss findings of these scientist regarding oligodendrocytes. However, this part here is a little bit more subtle, it comes in the last paragraph. Now if you remember, the structure of the GMAT passage, you'll remember that one introduces the topic. And may touch on the theory to elaborate some of that theory. And then three, oftentimes offers that counterpoint, the object on the authors part or somebody else's part. And it's in that third paragraph that we find the following. To substantiate such a claim, researches must demonstrate more convincingly the relationship between the ability of existing human oligodendrocytes to replace old oligodendrocytes and the speed of myelin regeneration. In other words, he's saying that, sure these are interesting findings, but the researchers have to do more to make them more convincing, the findings they have. So, therefore, the primary purpose is sure, to discuss these possible findings but ways in which these findings can be made more valid. That is my description of what the main idea or the primary purpose of the passage is. That doesn't mean the answer choice is gonna match up with that, but let's see how us anticipating the correct answer is gonna actually match up with what the correct answer is. Let's look at A. Discuss a new line of research and ways that it can improve our understanding of how the human brain functions. Sounds great. But, it is a little bit general and it glosses over, or indeed, completely ignores, the validation part of these researchers have to do more to show that their findings are valid or compelling. And A doesn't really touch on that. Next, we have B. Question the results of the finding of a study by pointing out several oversights on the parts of researchers. Now the thing about this, is that it does question results of findings but is the primary purpose to talk about these several oversights. And now, we get into some interesting semantic territory. There is an oversight perhaps, but something that the research should do is x, y, z. You see, calling in an oversight, maybe. But then, what about the word several? Are there several things that researchers are not doing? Well, if we go back to the paragraph, indeed there are not several things. He's saying one thing they should do or study to make their research even more valid is a, b, and c. Saying that's the same as several oversights doesn't quite cut it. Then we have C. And again, we're eliminating those two. C says, evaluate research finding and ways to build upon these findings given recent trends. I like this one, evaluate research findings and ways to build upon those findings given recent trends. This is where it starts to veer from, oh I like this answer choice, I think it's right I'm gonna stop thinking right around there, cause I see build on and that makes sense. This is kind of that fishy, rotten spot, what's the end say? Upon those findings, given recent trends, what are these recent trends? Well you can say there's a trend to start using, using human brains. But that is a little bit too vague. The recent trends again is not specific enough, and perhaps build on is, doesn't really talk or refer directly to the idea that their findings were not 100% valid that they needed to account for other factors. And that doesn't really recede, doesn't really encapsulate that meaning. Let's look at D. Discuss a theory and offer up several reservations about the validity of the theory. Now if we look here, this does not sound like a great answer choice, but does he discuss the theory? Yes. Does he offer up several reser, reservations? Yes. In terms of the validity of the theory. Why? Well, if we went back to the passage, we would see that the researchers and focusing on oligodendrocytes, and plasticity didn't necessarily account for both hemispheres, and in doing so, they could have studied x, y, and z. So, he has these reservations about the validity of the theory. And if we go back to our original answer, it does match up with though, that answer although not perfectly. So it's important that the right answer isn't always exactly right. 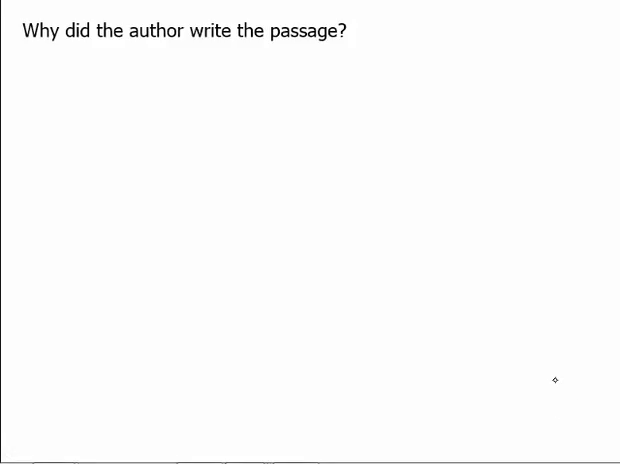 It has to be the best of the answer choices, and I think we get this more so with primary purpose questions than with other questions where the right answer as long as you find it in the passage and use the correct inference or correct support, usually the answer syncs up pretty well. Not necessarily the case with primary purpose. Let's look at E, now that we have the answer D. Again, it doesn't have to be perfect because look at E. Propose a theory in regards to how the brain is able to grow and regenerate after trauma. Wait a second. He never proposed a theory. He was evaluating a theory about the brain plasticity. Not proposing one. That's flat out wrong. The thing is you may not, of course, choose D right off the bat, and therefore you may wanna come up with a mark. I always use a squiggly mark, maybe you can use a check mark, but anything that you can use to denote that you're gonna come back to that, that one is a possible answer choice. And I think once you go through all the other ones and eliminate them, D is the last one standing, then of course that's the answer. If you are stuck between D and B, then you want to look at some of the small print, such as several oversights and compare that with several reservations to arrive at the correct answer choice. Okay. Let's move on to actually a different passage, one that I had at the beginning of the lesson types so it's not completely new to you. However, what I want you to do is reread it as soon as I say pause. And then come up with what you think, in your own words, is the primary purpose of the passage. Okay. So, I'm gonna, I've unpaused it now, and I'm also gonna show you here a little extra part that may influence what you think the primary purpose is, so make sure to include that. Okay? I assume you have your primary purpose. Let's see how close that aligns to what I have here. Discuss several theories regarding a historical phenomenon. Okay. This is kind of GMAT language and I admit most of us aren't gonna use this kind of language, but in general, you should have something about how it discusses three, or a few theories, and how it compares these theories. But what you shouldn't have, is that it criticizes any of these theories, or has an opinion about which theory is best, because the passage just simply doesn't. It's more describing the debate around a certain issue. Okay let's here, look at the answers choices. Given my little answer I came up with here, discuss several theories regarding historical phenomenon. Let's see what we have. Discuss several theories regarding historical phenomenon. Wow, that was easy. I did something that should always do. Which is read the entire answer choice. So, historical phenomenon and office support for one of these theories. In this part, it's clearly wrong. So just because something may alignings with exactly what you have, doesn't mean it's the answer, again, include the entire answer choice when you are weighing whether or not it is correct. B, criticize several theories and offer up a hypothesis that builds upon these other theories. Same issue here. Criticizing, there was never criticism or support, he hadn't or she hadn't taken an opinion on the issue. Next we have, contrast several theories, and show how one best accounts for observed trends. Again, there is opi, some opinion being injected in here, which one best accounts. And we don't have that in the passage. D, to provide an objection to several notable theories in a scholarly field. Also suffers the same fate of imparting an opinion, and therefore, that leaves us with E, to evaluate and contrast several theories regarding an historical matter. Again, there is no opinion stated, simply an evaluation and a contrast of the theory, theories out there. So that brings us to the end of the lesson. To summarize, you wanna make sure you read through the passage focusing on what the paragraphs are doing. And sometimes you can do that via looking at the topic sentences, or the first sentences, of each paragraph. Once you have an idea of what the paragraphs are doing, it's a good idea to come up with what you think the primary purpose is. Then, go the answer choices knowing that you may have to choose between two because oftentimes, the right answer isn't the perfect answer. But, again, anticipating what the correct answer should be will allow you to hone in on the correct answer choice quickly.